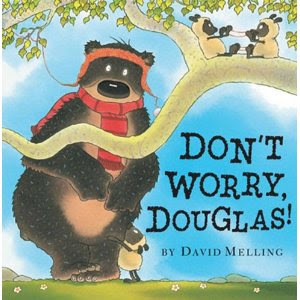 We've had a lot of children's books land on our door step these past few weeks which we've been spending time with and so I thought I'd share a few new titles that you might also want to keep an eye out for. These are books, pulled from the stack, that we have particularly enjoyed. I only recently read Bookworm1 (age 4 3/4) the traditional Three Billy Goats Gruff story. (It is in the 100 Classic Stories book I mentioned earlier this week.) 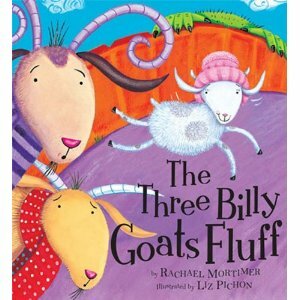 Three Billy Goats Fluff is a re-telling of the story by Rachael Mortimer (illustrated by Liz Pichon.) The troll in the story has been the main reason I haven't read him the book yet. However, I thought at the age of almost 5 (this month!) I'd go ahead and read him Three Billy Goats Fluff . Not surprisingly, he found the troll the most curious character in the book and also not surprisingly, we've read it several times over. In this particular tale, the three billy goats are extra fluffy because they eat some kind of marvelous grass on the other side of the bridge. The problem is that they trit-trot across the bridge rather loudly, always managing to wake the troll from sleep. The troll doesn't like to be woken up. (Who does, really?) He emerges from the bridge to yell at the goats. "I'm a Troll with a very sore head. Stop trip-trapping over my bed! there's nothing quite like little goat stew!" On the whole, it's a winner. 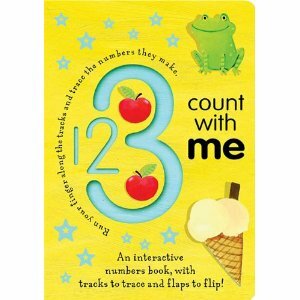 Lastly, we have enjoyed A Is for Apple and 1 2 3 Count with Me which are part of the Trace-and-Flip Fun series. 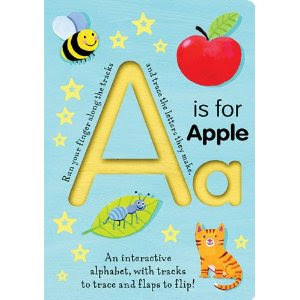 In the alphabet book, each page displays a letter that has tracks so that you can trace the shape of it with your finger. There are lines and numbers associated with the track to inform you which line should be drawn first on each letter and an arrow pointing out the direction the line goes. Each letter is also associated with a word and a lift-the-flap picture. Likewise for the number book. These books have been awesome for Bookworm 2 (age 2 1/2) who is currently learning his letters and learning how to count up to 10. Another winning book set from Tiger Tales in my humble opinion. They also have some new Christmas titles but I'll hold off on talking about those. They are best saved for another day. In the meantime, we're enjoying these. Thanks, Tiger Tales, for sending copies of these titles our way to check out. Thanks, Amy, for hosting Read Aloud Thursday! To find out what other people are reading with their kids, visit Hope is in the Word. These all look great, but I'm most interested in those tracing cards/books. That looks like a great way to introduce the letters and numbers.